I had a realization when I was at my parents' house over Christmas. We watched a home video from Christmas 2005 where I received as a gift a pair of gray Converse shoes and a pair of green flannel pj pants. The shoes I had worn with me to Texas that very weekend and were sitting in the back bedroom. The flannel pants I had just thrown out the week prior because they were looking a little thin. Seeing as they were 12 years old, I'm not surprised. I've always said that Facebook's TimeHop feature is useful not only to remind me how young I used to look but how old all of my clothes are. I've always been proud of the fact that I'm not addicted to shopping. I rarely buy clothes and get a lot of use out of my closet. But there comes a time in life where you really should stop wearing sweatpants from high school, and for me that time is now. 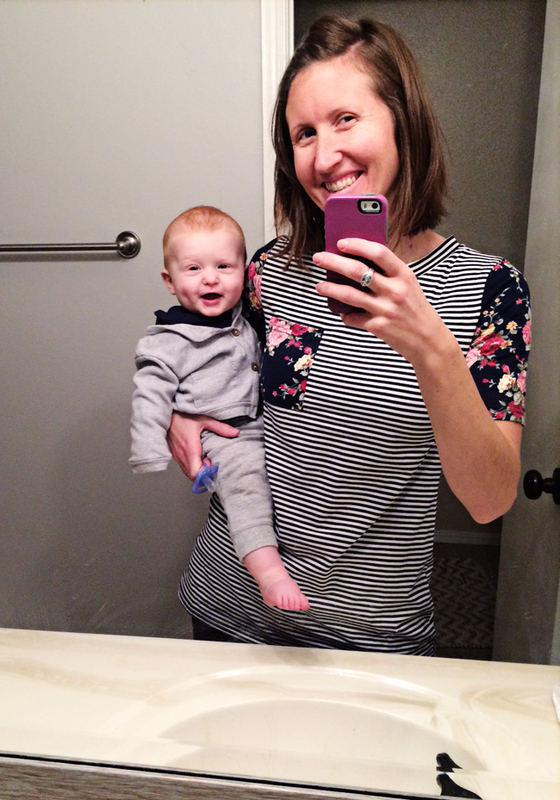 I've mentioned a few times on the blog that after having J seven months ago I have really struggled with my closet. Everything feels outdated and blah, and the more I think about how old all of my clothes are, I'm realizing that it's not just me. It's my closet. For the past 6ish months I've been on a bit of a shopping spree. It has been surprisingly fun to step out of my comfort zone a bit and be okay with spending more on clothes than I normally would. Of course, now I see where the trouble comes in, because once you open that box, it's hard to close. Usually I won't even consider a shirt that is over $20, preferably $12 or less if I'm being honest, but lately I've started saying things like, "It was only $40," which is very much unlike me. I tried StitchFix recently, which you know if you saw that blog post, and in general I have been more open to searching for quality pieces that are cute and make me feel good. I'm not a fashion blogger by any means--immediately obvious from the fact that I don't have easy access to a brightly lit room with a full-length mirror. My best bet right now is the bathroom at my office, but then you can't see my pants and shoes, and sometimes that makes the outfit. You can assume that right now for winter I'm wearing skinny jeans and either ankle booties or tall boots depending on the weather. I wanted to share a couple of recent outfits and finds that I'm loving lately. I might make this a semi-regular post if there is any interest. I do think it's kind of fun to see what other people are wearing to give me ideas for my own outfits. I recently discovered this website, which has so many cute, trendy clothes. I'm not joking that every time I wear something from this website, I get complimented. I snagged a double-hooded sweatshirt during their Cyber Monday sale and love it for casual Fridays at the office. Also, the lighting in that photo is truly horrible. I'm sorry. I tried out the above look a few weeks ago! I layered a long-sleeve flannel with a cardigan and really liked how it looked plus it kept me warm in my cold office without having to wear a coat. While I do use only my own monthly blow money to buy these clothes, I still do need to reign it in a bit. I don't want to get into a bad shopping habit, but I am excited to be filling out my closet quite nicely with some fun outfits! Last week I went to Nordstrom Rack and bought 3 new pairs of jeans. I honestly don't think I've bought new jeans in at least 7 years. I found two pairs of traditional denim and one pair of black skinny jeans. I'd like to find some cute sneakers or slip-on shoes, something like this maybe but not as expensive for the spring/summer. My shoes are super old also (see: Christmas 2005 Converse). Other places I like to look for clothes: Brickyard Buffalo (love) and Simple Addiction. (I've never bought anything from there before, but a friend recommended it, and they have such cute things!) There is also ThredUp, which I've never tried, but I have heard good things. 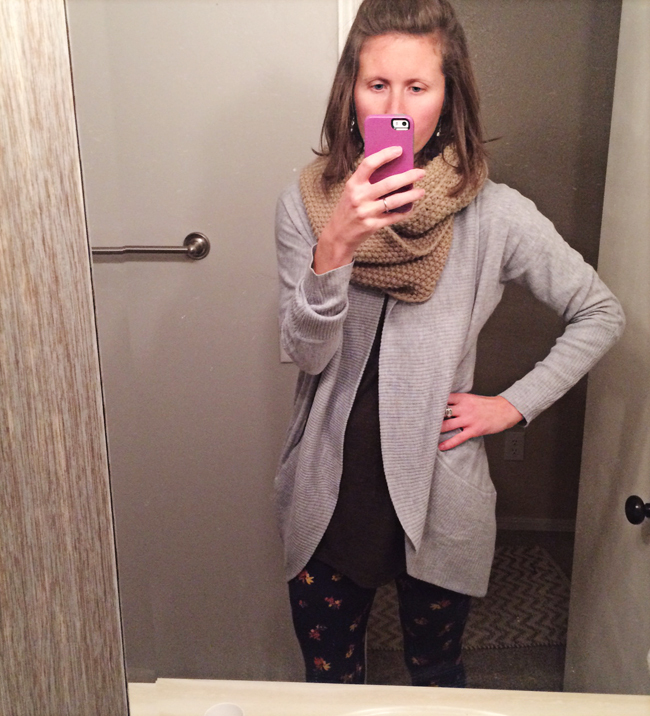 If you want to try out StitchFix, you can use my referral code to waive the $20 styling fee on your first box. My sweater below is from there, and I love it! Again, if there is any interest in this type of post, I might try to take pictures of my outfits and share them more on the blog, if only to motivate myself to try some new things. I've spent wayyyyyy more money on clothes in the last half a year than I have in my entire life perhaps, but it's been fun to feel cute about my outfits once in a while! Can you relate? How old are your clothes? Where do you like to shop online? Love seeing your outfits and clothes you buy! I got pretty bad with impulse shopping before Christmas because I was sick of my closet. Then one day I went through my closet to get rid of what I didn't want (tight things just aren't my jam anymore) and I found so many clothes I love and just haven't been wearing! Also, Target or Walmart for slip on shoes. I have a pair of almost fake converse and a pair of these slip on rose colored shoes and love them both. I say Walmart because they pretty much copied what Target had, ha. I love the striped jacket especially, and all these outfits are so cute! I would be one of those people who have a shopping problem AND I have a hard time getting rid of things, so it's not a good combo. I've been buying too many things in the last month, especially pants, because nothing fits! 😩 So needless to say, I'm due for a huge purge of my closet myself. LOVE that grey zip up, so cute!! I liked this post a lot, helps me to put different pieces together. I think my Stitch Fix was such a success because they used my Pinterest board to pick the clothes for me and I made sure to pin the exact styles I liked. There is a very good chance I may find myself in that striped zip up jacket thing. Because omg. I'm in love. And I don't really like florals unless they're with stripes. So like.. that might be happening too. You made some solid choices, my friend. The striped jacket is so cute! I love those types of looks. I'm currently in the process of going through my closet to see what I wear and don't wear. I have some tops that I wore in high school that I need to part with. The striped jacket is so cute! And the striped/floral t-shirt too! 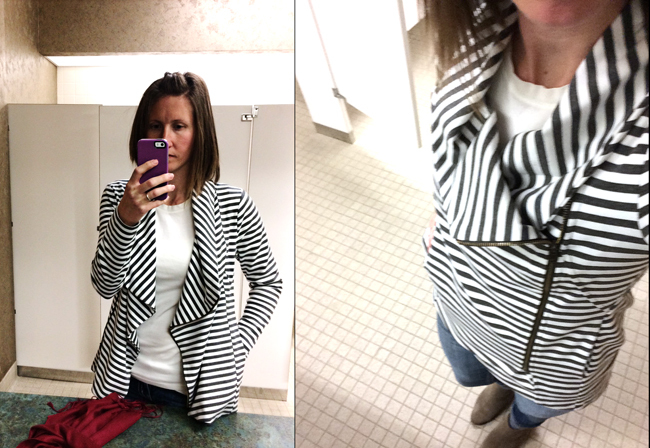 I love that striped zip jacket! I love seeing what normal, non-fashion blogger people are wearing. I dont like to take too many risks in my wardrobe, and stay away from super trendy stuff. So I relate much more to this than the typical fashion blogger outfits. Yes! Please keep sharing outfits! I love being inspired with different ideas for outfits. I don't shop for myself online (though for the little one - I definitely do) because I like to try on clothes before purchase. Most of my clothes are actually second hand from thrift stores. I know that's weird for some people, but I don't mind. Maybe it's from years of wearing hand-me-downs from my sisters, haha! Anyway, we have some good thrift stores here in Memphis, but the best ones are where my mother-in-law lives. Thrift store shopping is her favorite thing to do so every time we visit we end up going and I nearly always find something great. And girl, I definitely have some pieces that I've owned since high school, ha! We have tiny closets in our house (yay old houses, haha) so I have to keep my clothes to a pretty small number so once or twice a year I go through all of my clothes and give away anything I'm not wearing anymore. That first jacket is super cute!!!!! I really need to pick up some staple pieces for my closet. If you're looking for a few more outfits I just got three new shirts from a website "Shein" and I love them! Thanks for sharing your new outfits! Love the first jacket! You know I love a good outfit post so keep ‘em coming! You have bought some really cute things. I think there is a balance to strike between being keeping clothes forever and shopping all the time. It sounds like you are on the right track! I think your style is adorable meets classic. I LOVE the striped/floral shirt! 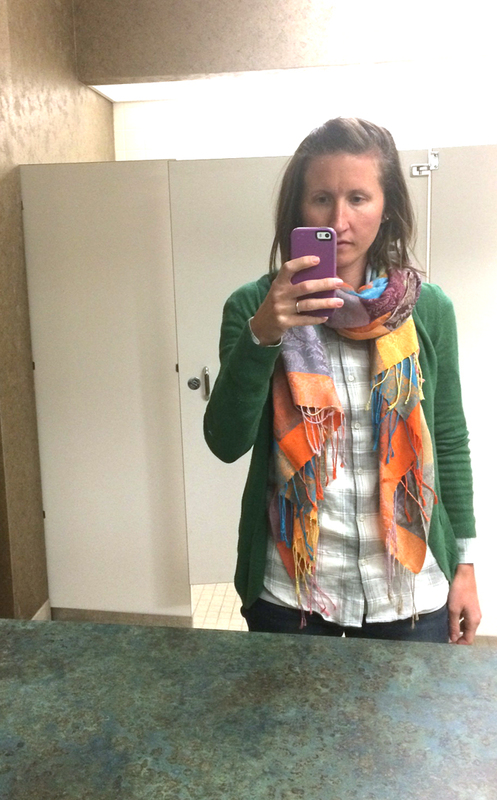 And I really like how you pair scarves with your outfits. I think you should definitely do more of these posts! Also... how was 2005 TWELVE YEARS AGO?! Hey! I found your blog through Audrey Louise's blog - I can TOTALLY relate - I have clothes that range from a Barbour I've had since I was at school in the mid 1990s (still don't fit it - parents were over optimistic about me growing, jackets from 15 years ago I still wear every year, to newish stuff (but I don't buy a lot - there is no such thing as a walk-in closet for most English people!). I don't particularly like shopping, don't read magazines or follow fashion trends. BUT it is nice every so often to have a re-vamp and it is nice to take some real-life style inspiration from bloggers. I must say I am a big scarf fan and love the scarves you've picked. You really suit the green too. Incidentally I have just picked up I am also married to a bearded one and have a red head child! Redheads rule! All the best, Joanne. I'm the same way with my closet! Some days I HATE everything in there and feel like I'm so no stylish or on trend at all and just want to go buy all the things. But then I think about the energy it takes to try stuff on and I'm like naah I'll just put yoga pants back on. HA! But in all seriousness, I love Old Navy and Loft outlet for clothes - those are my two go-tos, affordable and typically cute! A lot of my clothes are OLD! I have a lot of old pieces and definitely some new pieces, but I'm not much of a shopper lately, and when I was a "shopper" I bought all the wrong stuff. I've never been "stylish" so I don't feel like I have very much in the way of cohesive outfits and I don't know how to get there because it seems like I would have figured it out by now!! We are the same person! All of my clothes are old and I hate when old pictures show me that I'm still wearing the same clothes! Ha! That floral shirt is so pretty! I follow Mindy Mae's Market on IG and love their clothes. Those little boutique shops find the cutest items! Thanks for sharing!